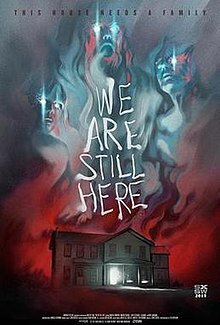 We Are Still Here is a 2015 American horror film written and directed by Ted Geoghegan and starring Andrew Sensenig and Barbara Crampton as grieving parents who find themselves the focus of an attack by vengeful spirits. The film had its world premiere on 15 March 2015 at South by Southwest. In 1979, following the death of their son Bobby in a car crash, Anne (Barbara Crampton) and Paul Sacchetti (Andrew Sensenig) have decided to move to a new home in rural New England. Paul hopes that it will be therapeutic for Anne, as the death has caused her to spiral into a deep depression. However, as soon as they arrive Anne starts claiming that Bobby is present in the house, and neighbor Cat McCabe (Connie Neer) warns them to leave the house. The house was built in the 1800s by the Dagmar family as a funeral home. The Dagmars were reportedly run out of the village after the townspeople discovered that they were swindling their customers by selling the corpses and burying empty caskets. Undeterred, Anne invites her friends May and Jacob Lewis (Lisa Marie and Larry Fessenden), as they are both spiritualists and could help contact Bobby, as well as explain the strange supernatural occurrences happening in the house. Upon their arrival the two couples go out to eat, during which time the Lewises' son Harry (Michael Patrick) arrives with his girlfriend Daniella (Kelsea Dakota). Soon after arriving Harry is killed by an apparition on the basement stairs while Daniella watches. She flees the house in horror and drives away, only to be killed a short distance away. The Lewises and the Sacchettis head home, after which Cat's husband Dave (Monte Markham) arrives at the restaurant, murders a waitress, and then angrily discusses the Dagmar house with the restaurant's bartender, revealing that the house needs to feed every 30 years or the evil beneath it will search out fresh souls, potentially destroying the town. Jacob eventually manages to convince a reluctant Paul to hold a seance with him while their wives are out. This ends with Jacob becoming possessed by the spirit of Lassander Dagmar (Guy Gane III), who reveals that they were never run out of town, rather the villagers used him and his family as a sacrifice to the evil under their home. Lassander, overcome with rage, then causes Jacob to kill himself. His wife May tries to flee, only to be killed by Dave, who has come to the house with the other townspeople, determined to give the darkness under the home what it wants. The Sacchettis then hear the voice of their son Bobby urging them to leave the house, and flee upstairs as Dave and the townspeople begin breaking into and entering the house. The spirits of the Dagmar family then proceed to violently murder every one of the townspeople in the house until only Dave, Paul, and Anne remain. Still intending to sacrifice them, Dave tries to kill Anne and Paul, but before he can do so, he is killed by Lassander's spirit. As Paul and Anne stare at the carnage around them, the spirits of the family depart from the house, finally satisfied with their revenge. Still believing her son is in the home, Anne dazedly walks into the house's cellar, followed moments later by her husband. As he peers down the stairs, Paul smiles slightly, then says "Hey Bobby". The score was composed by Wojciech Golczewski. It was released on July 7, 2015 from Screamworks Records. We Are Still Here had its World Premiere at South by Southwest on March 15, 2015. It was given a limited U.S. theatrical release by Dark Sky Films beginning on June 5, 2015 and was released via video-on-demand the same day. It was released on DVD and Blu-ray in the U.S. on October 6, 2015. The film was subsequently released on home video in Australia, Canada, United Kingdom, Germany, Scandinavia, Spain, and Taiwan. It opened theatrically in Japan on December 12, 2015 and in Russia on December 17, 2015. We Are Still Here was positively received at its World Premiere and subsequent release. Alongside the 2015 breakout hit It Follows, it became one of the year's most critically acclaimed horror films. Rolling Stone named it one of the year's ten best horror films. The film is "Certified Fresh" with a 95% rating on review aggregator website Rotten Tomatoes based on 43 critics' reviews. The Rotten Tomatoes "Critics' consensus" states, "Smart, powerfully acted, and devilishly clever, We Are Still Here offers some novel twists on familiar territory -- and heralds the arrival of a major talent in writer-director Ted Geoghegan." On Metacritic, the film has a 65 out of 100 rating based on 7 critics. Common elements of praise centered upon the film's atmosphere and visuals, which Twitch Film called "stylish and mesmerizing". Film School Rejects rated the film positively, praising it for its jump scares and stating that it "shows love and affection for genre". ^ "WE ARE STILL HERE (18)". British Board of Film Classification. September 22, 2015. Retrieved September 22, 2015. ^ Mack, Andrew. "SXSW 2015: Just Try Not To Make Eye Contact With This Poster From WE ARE STILL HERE". Twitch Film. Retrieved March 22, 2015. ^ Woerner, Meredith. "We Are Still Here Trailer Looks Like A Return To Super-Weird Horror". io9. Retrieved March 22, 2015. ^ "We Are Still Here". SXSW. Retrieved March 22, 2015. ^ "We Are Still Here (Original Motion Picture Soundtrack)". Amazon.com. Retrieved February 16, 2016. ^ "We Are Still Here - Schedule". SXSW. March 15, 2016. Retrieved February 16, 2016. ^ レイナス. "【グゲゲゲェ】黒焦げ一家のビジュアルがスゴい強烈ホラー『喰らう家』ワンコイン上映＆まさかの監督来日". Horror2. Retrieved February 16, 2016. ^ файл, добавил. "Мы ещё здесь - We Are Still Here". Kinopoisk. Retrieved February 16, 2016. ^ Macomber, Shawn. ""WE ARE STILL HERE" (SXSW Movie Review)". Fangoria. Retrieved March 22, 2015. ^ Hunter, Rob. "The Best Horror Movies of 2015". Film School Rejects. Retrieved February 16, 2016. ^ Weinberg, Scott. "The Best Horror Movies of 2015". Nerdist. Retrieved February 16, 2016. ^ Zimmerman, Sam. "10 Best Horror Movies of 2015". Rolling Stone. Retrieved February 16, 2016. ^ "We Are Still Here". Rotten Tomatoes. Flixster. Retrieved July 10, 2016. ^ "We Are Still Here". Metacritic. CBS Interactive. Retrieved September 22, 2015. ^ Harvey, Dennis. "SXSW Film Review: 'We Are Still Here'". Variety. Retrieved March 22, 2015. ^ Barton, Steve. "We Are Still Here (review)". Dread Central. Retrieved March 22, 2015. ^ Martin, Peter. "SXSW 2015 Review: WE ARE STILL HERE, A Refreshing Yet Disturbing Thriller". Twitch Film. Retrieved March 22, 2015. ^ Hunter, Rob. "SXSW 2015: We Are Still Here Explores Issues of Supernatural Squatter Rights". Film School Rejects. Retrieved March 22, 2015. This page was last edited on 3 March 2019, at 03:10 (UTC).